"Plymouth Adventure" 1952 Video Movie Review - Thanksgiving Classic! Turkey TIme! Get out the mashed potatoes and turkey! It's Thanksgiving time! What better classic movie is there to watch than "Plymouth Adventure?" I wish you all a wonderful Thanksgiving with your families or wherever you are! I know once I spent this holiday alone in Italy, and it was a bit sad...but we can all give thanks for everything we have! After all, we are all alive and hopefully well! I am thankful to all my viewers this year! You guys are the best! Spencer Tracy liked working with Van Johnson (he considered himself a mentor to Van)...their first film was A GUY NAMED JOE; and they also did STATE OF THE UNION, with Katharine Hepburn. Clarence Brown was one of MGM's noted in-house directors. I've read he was Clark Gable's favorite director. Brown's biggest hit, or at least one that was most lauded by critics, is probably THE YEARLING. You mentioned the movie earning an Oscar for special effects. In all the years that TCM has done the 31 Days of Oscar, I don't think they've ever scheduled PLYMOUTH ADVENTURE in February. It usually gets trotted out in November, and that's pretty much it. Regarding the love story between Tracy and Tierney's characters-- there was a formula in movie-making which still holds true today that the audience needs to see some kind of romance mixed in with the action. I agree that these two stars do not seem to radiate much chemistry. If it was made today, Van Johnson who is younger would probably be playing the role of the better looking captain and Van's part would be given to someone younger than him. There wouldn't be an older overweight actor playing the romantic lead as we see here. Tierney did this film on loan-out from her home studio, 20th Century Fox. She was seldom loaned out. My guess is that Fox wanted someone from MGM for one of their films, so a trade was made. I like how you included the sailboats in your commentary. Nice! Brown's "The Yearling" is such a dreamlike movie...I enjoyed it quite a bit. Thanks for commenting on why Van Johnson disappeared. It was unfortunate that he wasn't in it more. I'm definitely a fan of him! You're welcome. It sounds like the screenwriter needed to explain why Tierney's character would fall for such a man. Perhaps it would have worked better if she had developed a close friendship with him, because he resembled her father or older brother, and that was misinterpreted by others on the ship. There probably was a more realistic way to portray their relationship in the movie. These pictures were taken by a friend who was in Massachusetts today. 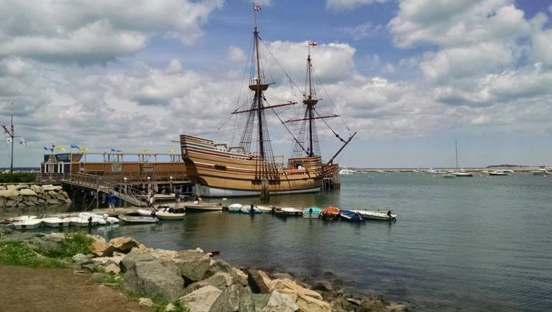 It is an exact replica of the Mayflower, called the Mayflower II. You can see how small the ship really was (holding over 100 people plus livestock). I've been there years and years ago and totally forgot how it looked! Thanks for sharing this TB! 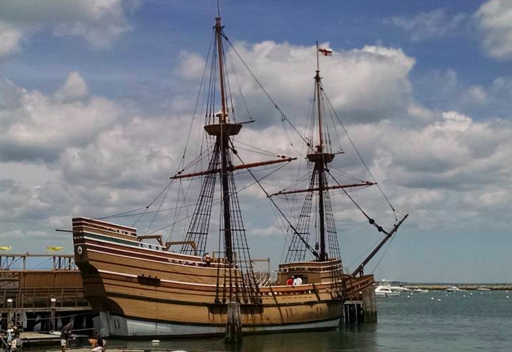 Those are amazing photos and truly show how little the Mayflower was. TCM will rebroadcast PLYMOUTH ADVENTURE on Sunday November 20th.